THE EPIC VIEWS in Southeastern Utah cannot be adequately portrayed with photos. You have to see and explore these locations for yourself, hike the unique landscape of the area’s national parks and monuments, and learn about the various Native American tribes by visiting the ancient ruins and rock art. Once you experience SE Utah this way, it may be hard to leave. 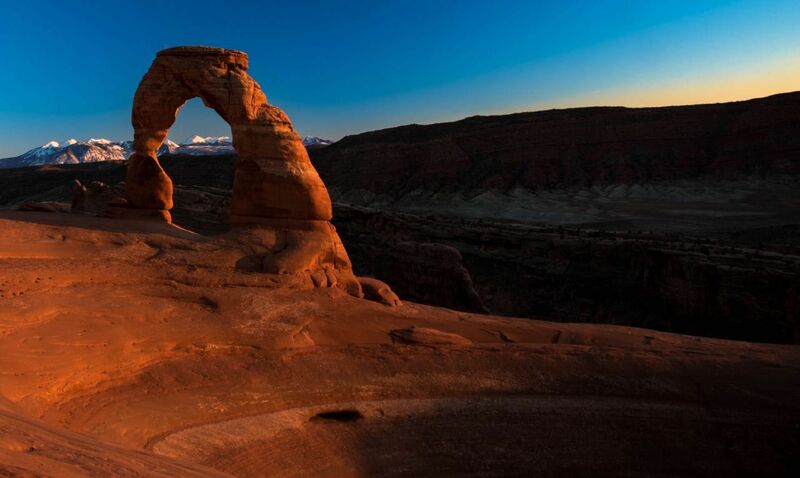 Delicate Arch may be the most recognizable arch in the world. It has become an icon for the state of Utah. 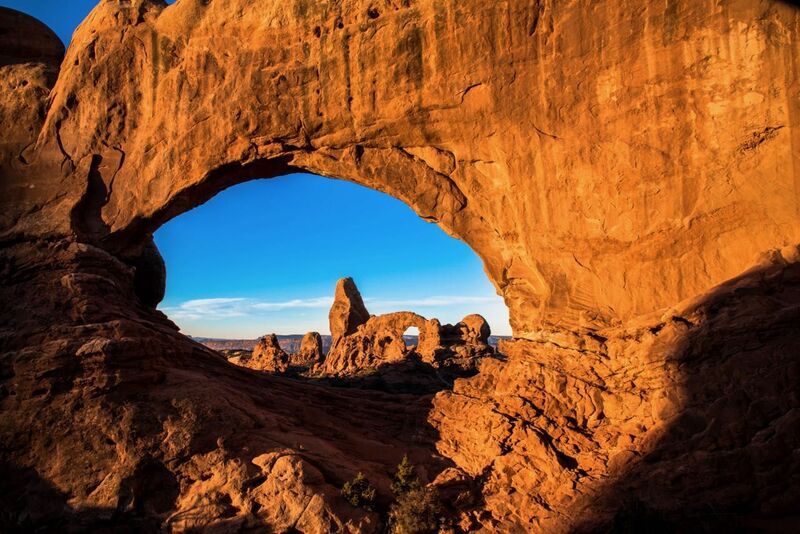 The arch is found in Arches National Park near Moab, Utah. To reach the arch you must ascend more than 480 feet above the trailhead. The freestanding arch is hidden in a bowl at the top of a sandstone fin. 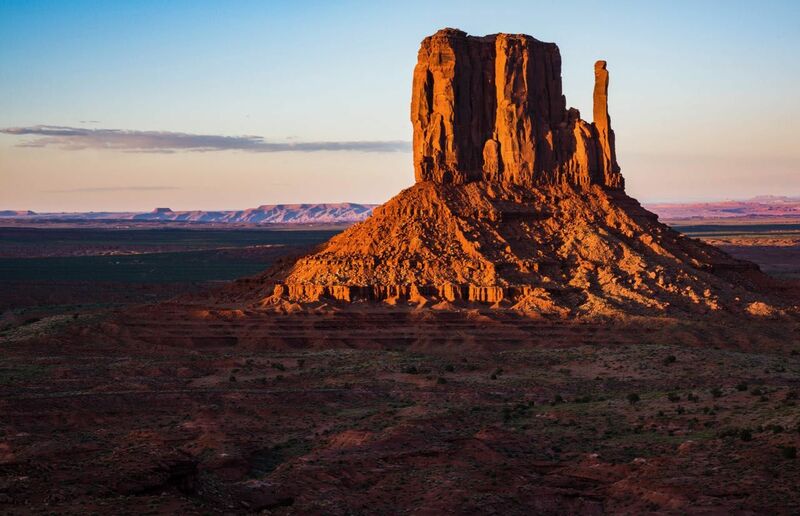 Monument Valley’s landscapes have become symbols of the American West. The Monument Valley visitor center has a great viewing area, but for the real experience, take the 17-mile scenic drive into the valley. The only way to see the back roads and sacred lands is with a local guide jeep tour. Cedar Mesa is a rugged and remote area near Blanding, Utah. It is believed to contain thousands of Puebloan archeological sites that date from between 2,500 to 700 years old. 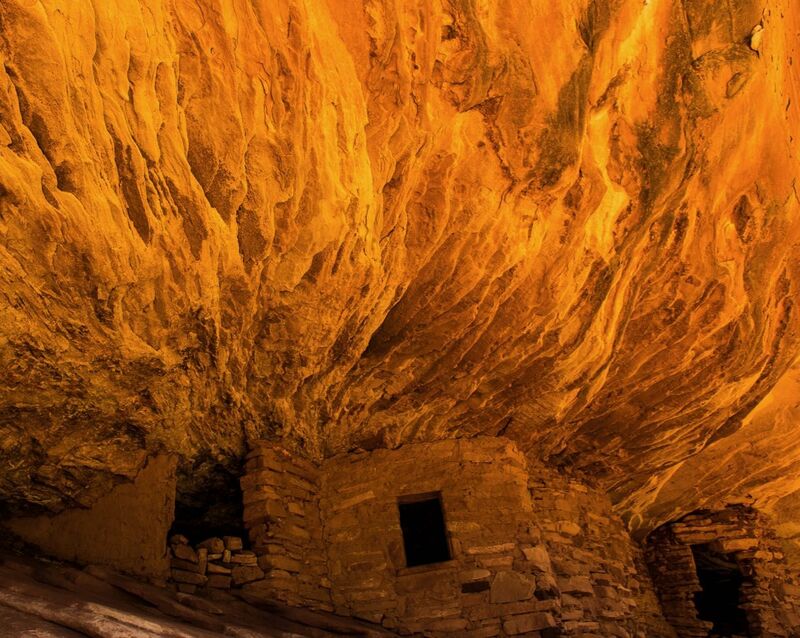 One of the most famous is commonly called the “House on Fire” ruin. It is located about 1 mile along the South Mule Canyon Trail. You will find four main arches in the Windows Section at Arches National Park near Moab, Utah. North and South Window, Turret Arch and Double Arch. 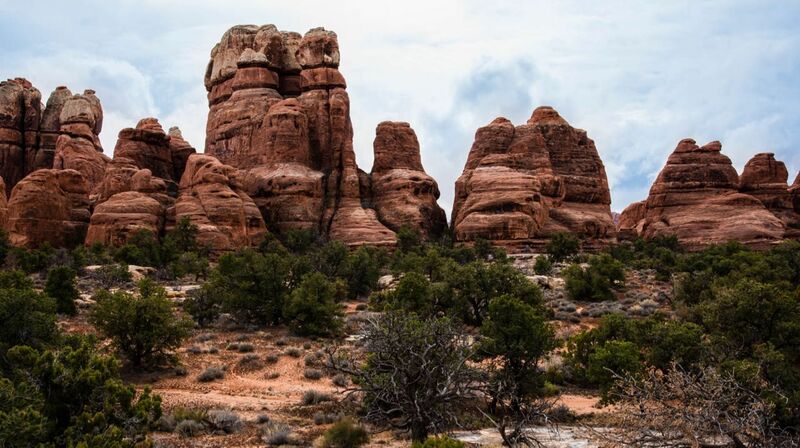 Hike the short trails to see all arches. You can even climb around and inside the arches here. A favorite photography spot is capturing the image of Turret Arch through the North Window. Three natural bridges in this area were carved by flash flood runoff water. You can see them from above at overlooks or hike the trails and see them from below. If you are looking for epic scenery and adventure away from the crowds, this is the place. 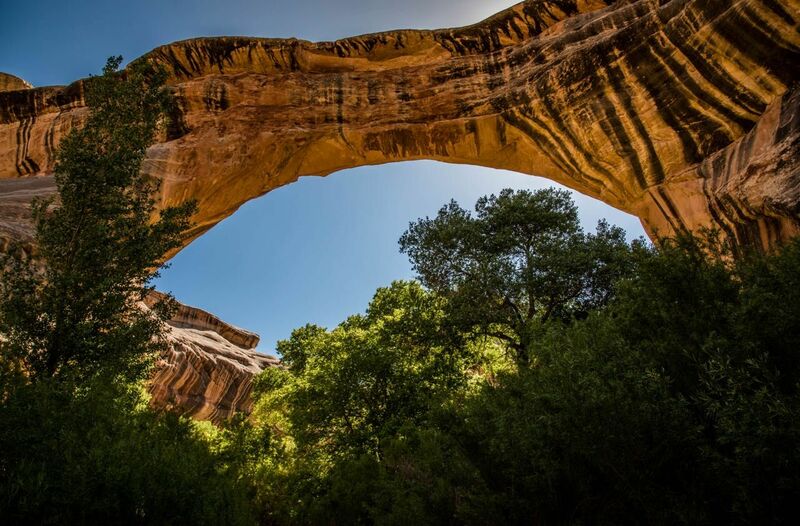 Natural Bridges is 46 miles from the small town of Blanding, Utah. Hike the short, easy trail along dirt and slickrock to reach Mesa Arch in Canyonlands National Park near Moab, Utah. The arch is right on the edge of a 500-foot cliff, part of a 1,200-foot drop into Buck Canyon. If you have children along, watch them carefully around the arch. 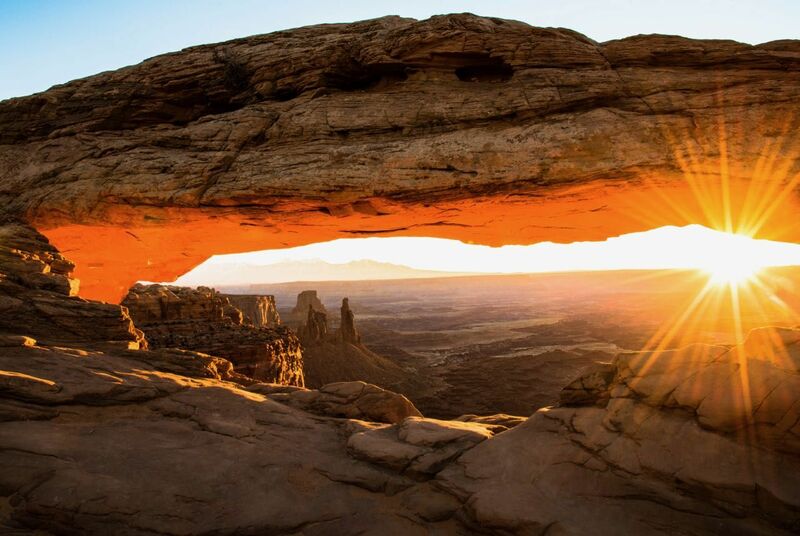 Due to the east-facing window, Mesa Arch is a very popular place to watch the sunrise. Be prepared to share the area with other hikers and photographers. 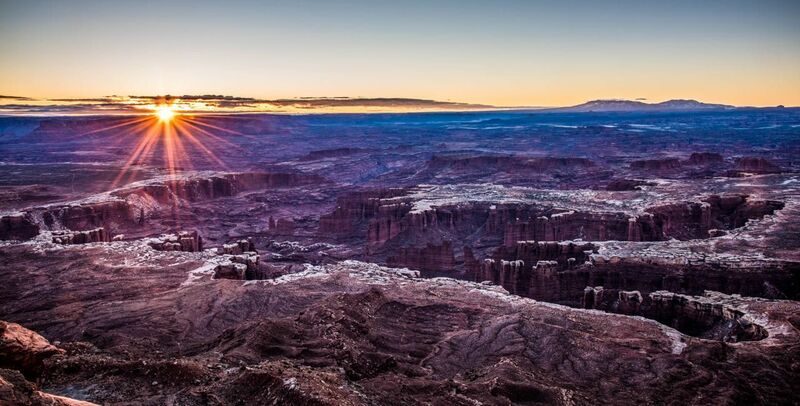 The Needles District of Canyonlands National Park is 137 miles from Island in the Sky near Moab, Utah. Due to the remote location, there are relatively few visitors. This part of the park features extensive hiking trails, amazing geology, and ancient ruins. You can walk short trails to Puebloan granaries, hike around and through the Needles rock formations and drive along four-wheel-drive roads that overlook the Colorado River. 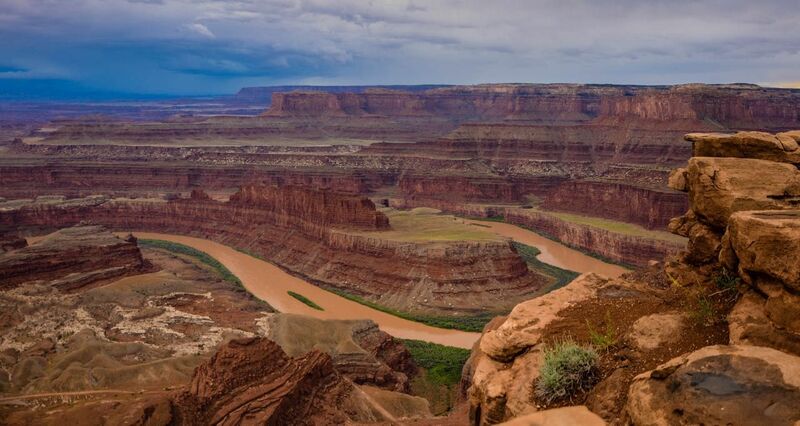 View the Colorado River from 2,000 feet above from Dead Horse Point State Park near Moab, Utah. This view is one of the most photographed landscapes in the world. Walk along the rim trail to see different parts of the river and canyons below. The name of this park comes from the legend that horses were left corralled atop the mesa and died of thirst. The path from the parking area to the overlook is fully paved and accessible for the first 300 feet. From this point, you can walk the 2-mile round trip trail to the end of the mesa. Do not get too close to the edge and watch children at this viewpoint and along this trail. Take photos at dawn to capture the sun as it rises to get sunbursts or focus on smaller sections of the white rimmed canyons. The view at Goosenecks State Park is vast. 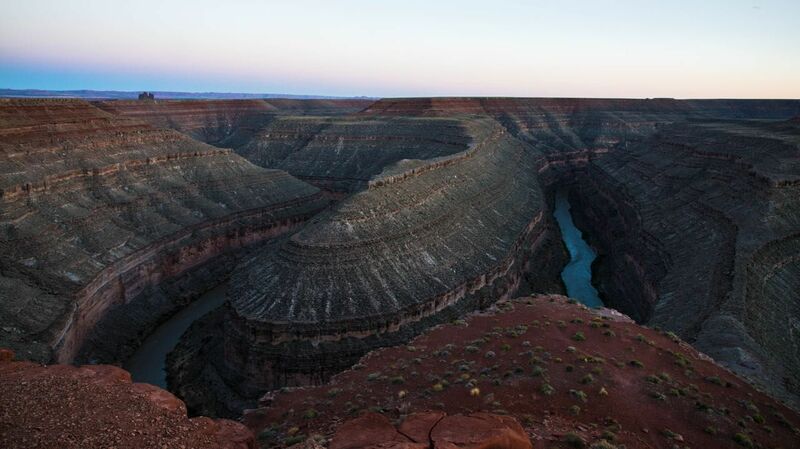 Look down 1,000 feet to see the San Juan River run along a series of tight loops, or goosenecks, carved by the river. The remote park is 25 miles from Bluff, Utah and worth the drive to see this unique landscape. Newspaper Rock is a petroglyph panel etched in sandstone. The symbols represent 2,000 years of activity by the Fremont, Anasazi, Navajo and Anglo cultures. The meaning of the symbols is not clearly understood, but there are many petroglyph sites throughout the SW. The panel is right next to Utah Route 211, between Moab and Monticello on the main road into the Needles section of Canyonlands National Park. 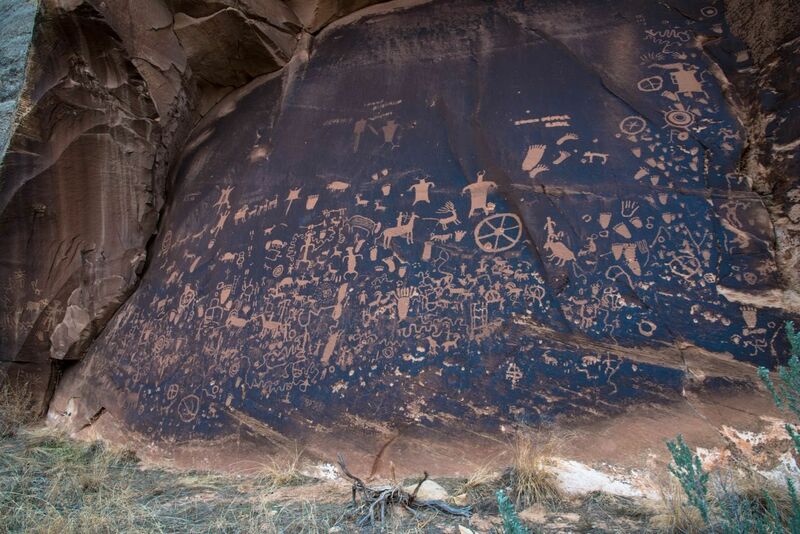 Take the time to stop and see one of the finest displays of Indian rock art to be found anywhere in the U.S. It is one of the few petroglyph sites that is easily accessible and can be viewed at close range. Explore a landscape with scenery similar to Monument Valley, but without the crowds. 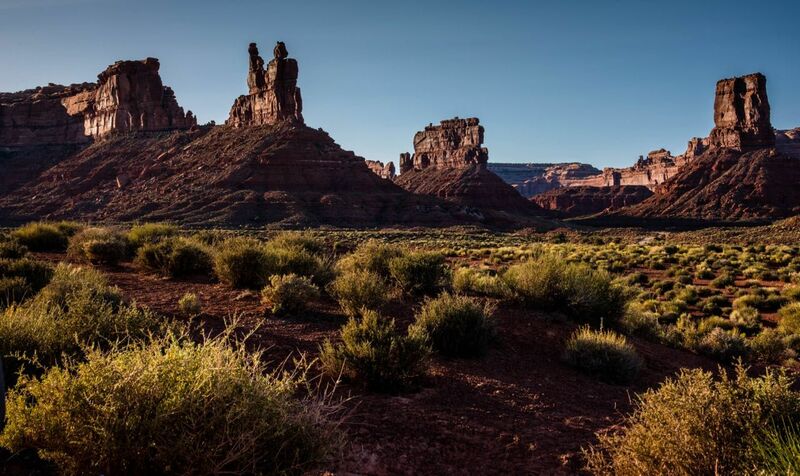 Drive the 17-mile dirt and gravel road as it winds through the Valley of the Gods near Mexican Hat, Utah. The road is sandy and bumpy with a few steep sections. Have your camera ready since the area is known as “a photographer’s paradise.” Stop at scenic locations and hike around to enjoy a more private personal experience here.